Any technology is only as good as the associated customer services. 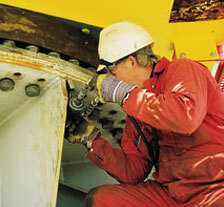 Romackcrane fulfils the most stringent quality and safety standards and are renowned for their reliability. In the unlikely event of problems, you can rely on our excellent support service. Our service technicians provide you the best support via phone or in project location. Spare parts are dispatched from different well-known companies, where many components and assemblies are held in stock. As a matter of course we can also deliver spare parts for older ranges in a fast and easy way if required. Just-in-time delivery is part and parcel of our services. In order for your spare parts to arrive at your company safely and on time we are only working with selected transport companies who share our demands in ourselves. Speed and flexibility are the most important categories – especially on behalf of your customer in respect of standstill and outage times. If your customer is satisfied so are we. We offer our clients technical training with focus on crane operating, electrical and mechanical engineering, as well as special trainings. The training courses, some of which last several days, take the form of preliminary theoretical instruction, supplemented by practical exercises on fully functional training models.